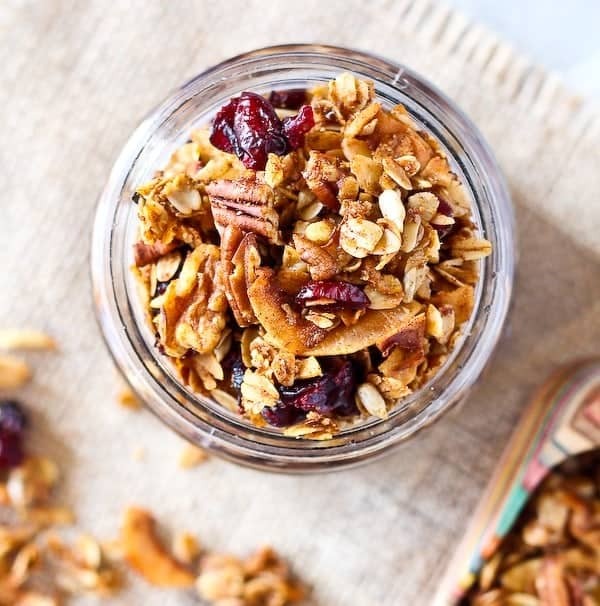 This easy granola recipe with pecans and cranberries will become your go-to homemade granola recipe – you won’t ever be buying granola from the store again. This is way too easy! I make granola probably once every other week. Ben eats the majority of it for his breakfasts or a late night snack. Late being 9:30pm, because we’re old. I’ve gotten to the point where I just throw stuff in to a bowl and whip this up, but even if you don’t have the recipe memorized, you won’t find it difficult at all. I should add that the bowl I use is a huge stainless steel bowl that I use for popcorn. It’s from my grandma and I love it with all my heart. It’s completely indestructible and I just love that it’s from my grandma. It’s perfect for tossing this granola because I can do it quickly and not worry about messes. There’s nothing worse than a too-small bowl. And believe me, I’ve been there many a time. Gingerly stirring, trying not to make a mess. It’s the worst! And I never learn. Thankfully, I have my granola game down to a science. 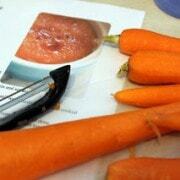 I wrote this recipe to use one measuring cup (1 cup) and one measuring spoon (1 tablespoon). There’s no need to dirty 4 measuring spoons and 3 measuring cups. That is not what we are going for here. Easy. Easy. Easy. Okay that’s not entirely true. 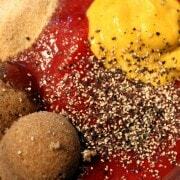 It does call for 1/4 teaspoon salt but if you can just shake a little into your palm and eyeball that. And the nut measurements are 1/2 cups but you should eyeball those too. This is not an exact science at all – it’s a very forgiving recipe. 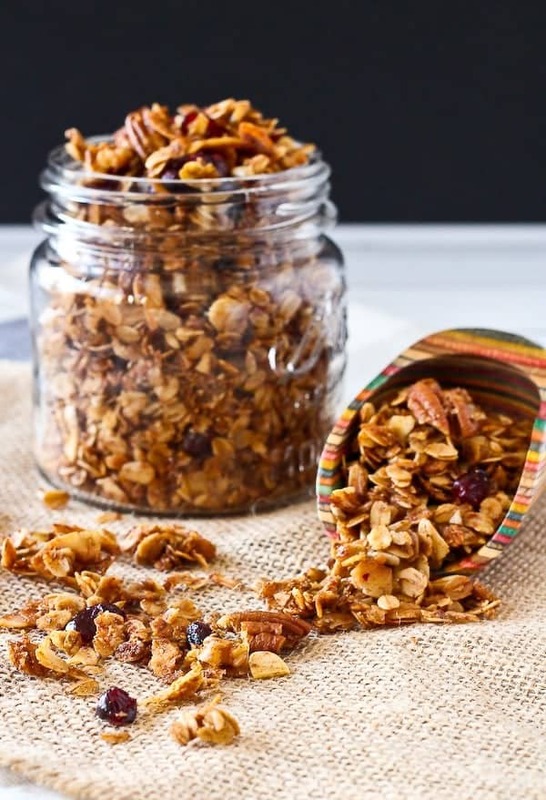 We love this easy granola recipe heavy on the cinnamon (the recipe calls for 1 heaping tablespoon, and I’ll admit, sometimes I add even more), but if that sounds a little overwhelming to you, feel free to scale back a bit. I will say that mannnnnnny people have eaten this granola (I love gifting it during the holidays) and everyone has raved about it. Massive amounts of cinnamon and all. Another great thing about this granola is that you can add whatever you have on hand. Coconut side note: I love this coconut. I really do. It’s the best I’ve found and I can’t get enough of the big giant flakes. Hope you love this granola as much as we do! If this one doesn’t sound perfect for you, try almond mocha granola, Biscoff granola, cinnamon flax granola, or another variation of granola with almonds and pecans. 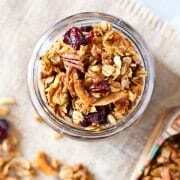 Make this easy granola recipe today! 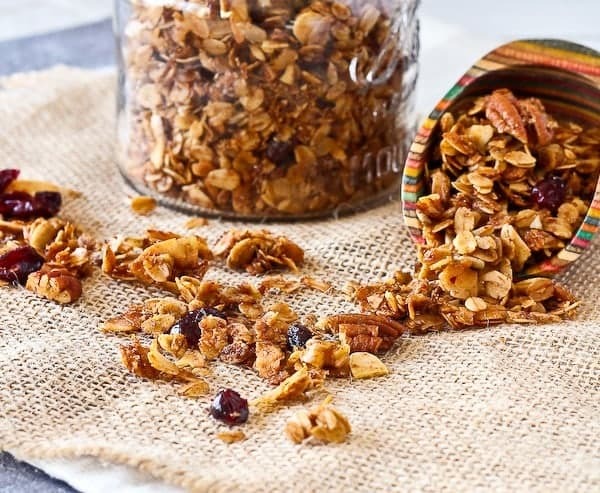 This easy granola recipe with pecans and cranberries will become your go-to granola recipe – you won’t ever be buying granola from the store again. This is way too easy! Preheat oven to 300°F. Spray a sheet pan (rimmed baking sheet) with nonstick cooking spray. In a large mixing bowl, combine oats, sunflower seeds, walnuts, pecans, almonds, coconut, flaxseed, wheat germ, ground cinnamon and salt. Stir to combine. 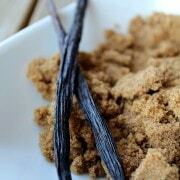 In a 2 cup microwave-safe measuring cup (or small bowl), add oil, honey, brown sugar, and vanilla. Heat in microwave for 45 seconds on 50% power. Stir to combine. If using coconut oil, continue to heat in 30 second increments until coconut oil is completely melted. Pour over dry ingredients and stir until everything is coated. Spread into an even layer on prepared baking sheet. Place in preheated oven and bake for 15 minutes. Remove from oven, stir, and continue to bake for 15-20 minutes or until golden brown. If you like big chunks, press down with spatula and let cool completely on pan. If you prefer not to have large chunks, stir 3-4 times as granola cools. Stir in cranberries once cooled. Verdict: I love this easy granola recipe. It is great on top of ice cream too. Husband’s take: He loves granola – he likes it better with just sunflower seeds and almonds but I adore it with pecans and walnuts. Changes I would make: None are necessary but it’s a fun and easy granola recipe to experiment with. Rachel, It looks fantastic and simple. Going to try this weekend! I like making large batches of everything so we always have it on hand and clean up less often… how long will it keep? Will it go stale or mold over a few months? We can always seal it in jars or vacuum bags I guess? You’ll definitely want to keep this in a covered container. I’d say it would store for a month or so, maybe more. If you want to extend it and keep the pecans from becoming rancid, you could store it in the fridge. Enjoy! I just made a double batch of this granola. Scrumptious!!! We use it on yogurt with fruit. I keep a jar of it at work to keep me from going to the vending machine when I want something sweet or crunchy. Thank you for the recipe! I made it exactly as listed except for the wheat germ because we didn’t have any on hand. Thanks! Comments like yours make me SO happy! I’m so glad you liked the recipe and that it’s crushing those midday cravings! Thank you so much for taking the time to come back and leave a comment! Ummmm……when do I add the cranberries? Sorry about that omission! You stir them in after it’s cooled.